Sycerika McMahon completed the Canadian National Championships on Saturday with Commonwealth Games nomination times in five events. The Portaferry teenager swam nomination times in the 50m, 100m and 200m breaststroke, 400m freestyle and 200m individual medley. McMahon is the only local swimmer to achieve the nomination times so far. The qualification period due to end after the Irish National Championships in Dublin at the end of the month. McMahon's times in Victoria, with nomination times in brackets, were 50m breaststroke 31:92 (32:54), 100m breaststroke 1:09.66 (1:10.86), 200m breaststroke 2:30.86 (2:32.60), 400m freestyle 4:16.91 (4:18.32) and 200m individual 2:17.63 (2:18.67). 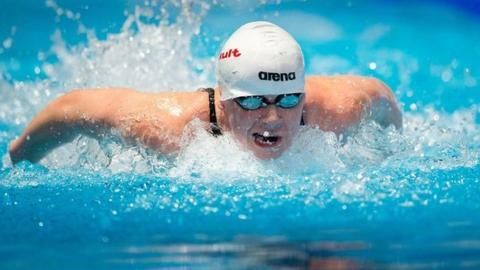 She represented Northern Ireland at the 2010 Games in Delhi as a 15 year-old. The 2012 Olympian's times are also inside the qualification standard set down by Swim Ireland for the European Championships in Berlin in August.